Grand Theft Auto is a series of video games which would soon release its new series: GTA 6 with rich graphics and additional features. After the great success of GTA 5 none of us has any doubt that the upcoming new series would be super hit like any other prior series. 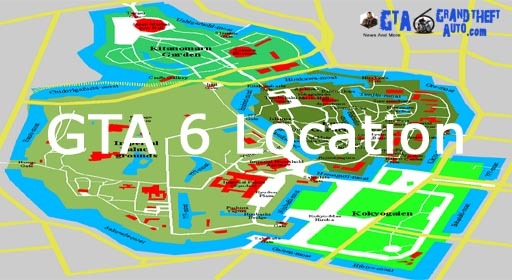 GTA 5 happened in the city “Los Santos” and now speculations are being made about the place where GTA 6 would happen. We can never put an end to these speculations and rumors but for sure we can give a meaning to them. GTA 4 took place in “Liberty City”, GTA 5 took place in “Los Santos”, and next in the series is GTA 6 which could probably take place in “Vice City 2” as heard from the sources. But there are few other beautiful places we expect to see from Rockstar for Grand Theft Auto 6 to keep gamers or game lovers more engrossed with the upcoming series. We should not necessarily be stuck in United States, where the majority of the GTA titles have taken place. In fact “Grand Theft Auto: London” was the only GTA game which took place outside of the US. Why don’t we try some other place than US, that mean’s there are many superbly vibrant cities around the planet which could be a great option to be considered for GTA 6. Here we take a look at few of the possibilities for the next generation GTA. This Japanese city is startling and even has beautiful designed architecture. The city has a mixture of classical Japanese history and a reflection of western culture. The dazzling lights of Tokyo, great location and number of islands belonging to the nation would undoubtedly give you reasons to explore this city and outside of the city. Las Vegas as we all have heard is one of the most beautiful places on the planet. Well, apart from being beautiful, it has the overly lavish architecture, and the surrounding deserts makes the place more than just being beautiful. We are surprised, why none of the GTA series took place in Las Vegas? The city deserves it and would also be a perfect place to hide a body or two because of the desert surrounding areas. Miami is the 42nd largest city in the US with beautiful surroundings and Miami Beach is one of a wonderful attraction there. And now when the players are adapted to water and can actually swim, then this could be one of the most “has to be” places for GTA 6. Also, it may be a good time to reconnect with Vice City whose part 2 i.e. “Vice City 2” is probable to be a chosen location for GTA 6 as per some sources. Paris, a part of France is known as the most romantic destination of the world. It has famous landmarks, beautiful places and most beautiful Eiffel Tower to keep a player keen and interested. If GTA 6 will take place here, then many of the GTA lovers will enjoy around their dream location. This would undoubtedly magnetize the game lovers towards it. There could be places like “Vice Beach, Sin City, Capital City or many others” where you want GTA 6 to take place, but if given a deep thought, it hardly matters where Rockstar plans to take us next, undeniably it will bring the best experience. Else, you have the time to decide which city you would love to see in GTA 6, because GTA 6 will not be released before 2018. Below is a poll for GTA 6 and if you want this places to be included in GTA 6 then just vote for it and if you don’t find your location please enter your own. What if you could travel all over the world. I think it’d be cool to choose where you want to go. Belfast northern Ireland .its such a big place. THE EARTH. THE GTA 6 EARTH. like real earth if you break / do stuff some one repairs/rebuilds and it will take time. I want to be able to c4 any building and to see bricks everywhere then cleanup crew then nothing or builders build same/different building. i want to remove wheel/s just for fun. Realistic car parts – loosen brakeline, lose the bolts that hold the frame together, and so on. I like the idea of bringing Miami back into play because its an amazing city Beaches, Gangs, boats, planes, bikesm, jet ski’s. I like Introducing Chicago as well Skyscrapers, Gangs, Project buildings, High Crime, Night Clubs, United Center Arena, boarded up houses. Next one should be in Chicago. With the diverse gangs and history with the Chicago mob would be cool. Why not Chicago? I like the idea of bringing back the 70’s and i think Chicago would make an great choice. You have a very interesting city landscape with gang territories all over, Chicago mob, corrupt polititians/police and many more things. I mean if NYC is an option i think Chicago would provide a more interesting game play. It is a city that i think would best mesh gangs and the mafia like first games. Another option is Mexico with all the existing cartels all over the country, maybe somewhere in Tijuana with San Diego giving the possibility to go back & fourth between U.S amd Mexico which can add more excitement as military gets involved for illigal entry at either country. Also if you could have an option to build an organization like gang/mafia and recruit Online users as well as computer population would be cool. As you can initiate gamg wars and make online more interesting. I guess the writer never saw the umpteen articles earlier in the year about Rockstar going to Tokyo to take a million photos and then decide that Tokyo would never work because of its street network and how it was non-conducive to a GTA environment. I think be different if it be in U.K or somewhere else rather than based around America all the time. I will picking Las Vegas or Miami. Neither of one will be in GTA 6. I think it should be located in Jacksonville, Florida. They must be able to get girlfriends and get married and you should know the rest of it. They should be able to go to stores buy food, games, grills, and must be able throw parties. Also, must be able to become a police officer. Put it like a CSI: Miami video game. GTA is a crime series centered around “crime” the chances of them making a police option is slim but much more open than adding relationships and turning it into another sims game..
Amsterdam would be amazing, has all the cool elements you would desire….. The should try earth for a change, where you can explore the whole world. Missions in Nigeria will be the most difficult i swear. All of the states in america. All makes and models of cars with cockpit view.